ISE (Stand #1-F6), AMSTERDAM – February 7, 2017 – HARMAN Professional Solutions, the global leader in audio, video, lighting and control systems, including networked AV, today announced new firmware for AMX RoomBook scheduling touch panels, making them part of the new Acendo product family. The new firmware features numerous usability and setup enhancements that help users ensure installation success and accomplish their scheduling goals faster, more intuitively and more efficiently. 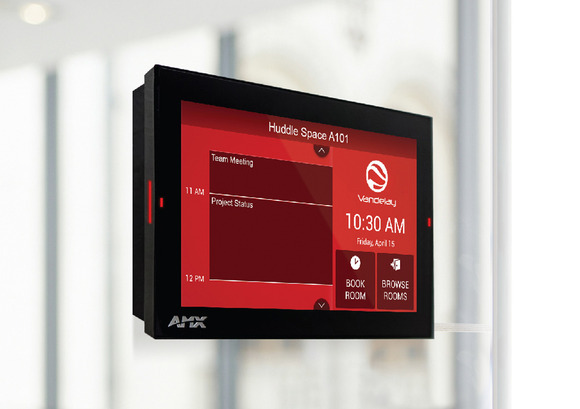 "Since we introduced AMX RoomBook scheduling touch panels in March 2016, business worldwide have adopted them to optimize room utilization and implement facility-wide room scheduling in an intuitive and cost-effective manner," said Michael Saadeh, Product Manager for User Interfaces, HARMAN Professional Solutions. "Now, thanks to our new firmware update, the newly designated Acendo Book scheduling touch panels offer customers full scheduling integration with other Acendo products, plus enhanced usability, networking and setup. This update builds on HARMAN's commitment to providing our customers with the industry's most intuitive, responsive and worry-free scheduling solution." Acendo Book scheduling touch panels are standalone scheduling panels that integrate directly with popular room scheduling software like Microsoft Exchange, Office 365, and Google Calendar without additional system software or hardware requirements. The user interface background color and built-in room availability bars change between red and green to show room availability, enabling users to easily locate and book an available room directly from the panel. If that room is currently booked, the "Browse Rooms" feature allows users to quickly locate the nearest available room or the next available time from either Acendo Book or Acendo Core. Leveraging the style and cost-efficiency of HARMAN's award-winning Modero S Series Touch Panel, Acendo Book touch panels enable a simple swipe to glide through the room's calendar to check availability, a brilliant full-color high-resolution display, wide viewing angle of screen and availability bar LEDs and a low-profile design. The panels can be mounted on any flat surface, including drywall, gang-box, glass, or stone, inside or outside a conference room or huddle space. Acceleration of "Book Room" and "Browse Rooms" functions, so requests now take less than 1 second. Enhanced Calendar View text display for ad-hoc and long meetings (4+ hours) provides more information about the status of requests. Improved progress notifications when waiting on scheduling server confirmations. Support for Greek and Hungarian languages (16 languages now supported in total). Support for proxy servers and custom security certificates enables IT departments to deploy AMX RoomBook in accordance with their corporate network and security policy mandates. Easier scheduler credential setup with the ability to validate scheduler credentials in the setup wizard. Detailed error logs for connection errors in setup and improved debugging tools for installers. Acendo Book scheduling touch panels will begin shipping in March 2017. Version 1.1 firmware will be available for existing AMX RoomBook systems in March 2017.